Pauline Latham said she had been ‘misconstrued’ by colleagues last month after she said it was best for Syrian child refugees to be kept in the Middle East. Pauline Latham’s response to Daniel Grimwood tells us everything we need to know about Conservative Party values. She doesn’t care about refugee children – even though they may be fleeing from wars she and her fellow Tories have supported. She doesn’t care who takes responsibility for them – as long as it isn’t her. And she doesn’t mind trying to offload the issue of her own callousness onto a local council that the Conservatives have already overloaded and underfunded. Didn’t the Tories say councils can’t take on any more refugee children, while they were defending their decision to close the Dubs refugee scheme? 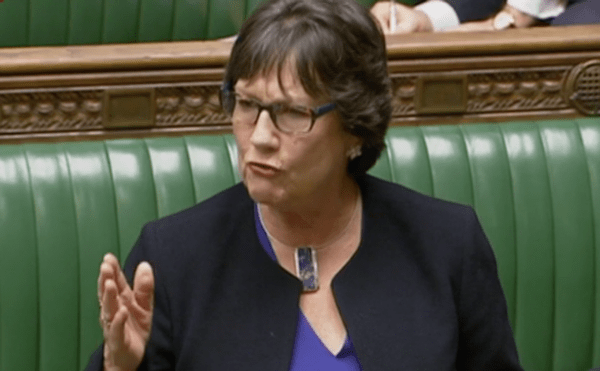 Her attitude tells us everything we need to know about Conservative MPs and the voters who habitually send them back to Parliament – although some might be having second thoughts after learning of her attitude in this matter. Perhaps Mr Grimwood could be persuaded to stand for Parliament next time? He, at least, seems to have the well-being of others at heart. An MP who caused a storm after she said people should “stop being so sentimental” about child refugees has reignited the row after she poured scorn on a voter who discovered a lorry full of desperate children abandoned in a Kent carpark. Daniel Grimwood, 40, wrote to Tory MP Pauline Latham after he heard her speech rejecting the need to give sanctuary to child refugees. He recounted a story of how he and his friends had heard banging coming from within a lorry while they were out jogging, leading them to alert the police. “Had we not been there some or all of these children would almost certainly have died in a parking lot on our shores [he wrote]. Yet another nasty piece of work.